On November 18th 2017 three of the Hidden Sword assistant instructors took their shodan (1st degree black belt) exam in Kobudo. 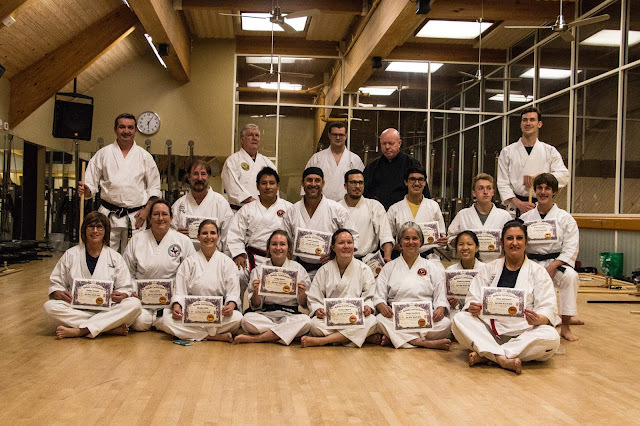 In January of 2015 they started the AKATO class with 35 students who were all brown belts to multi degreed black belts. Over the course of almost three years they took their green belt exam, their brown belt exam and finally now their black belt exam. All of the while the class kept shrinking. In the end there were eight women and seven men taking the exam. Jackie Bradbury was a shoe in for the class, Kimberly was 11 years old (truthfully, I thought she was 12) so I had to ask special permission for her to attend since the requirement was the student was a brown belt and 13 years old. Both Jackie and Kimberly had been training in the Kobudo class at Hidden Sword for over a year so GM Proctor and GM Yates allowed Kimberly to join. 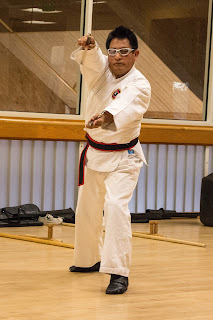 After the first year Tomas who had since rejoined our HSMA program was allowed to also start the AKATO Kobudo program. 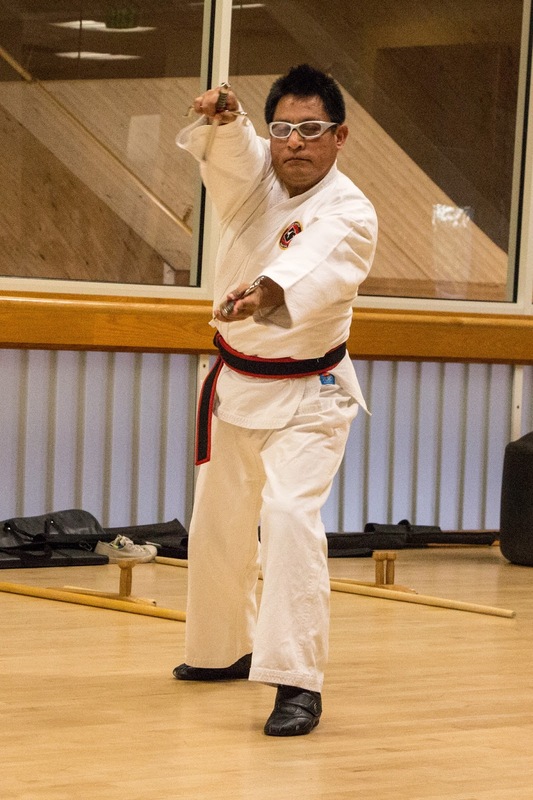 Tomas had been working with our Kobudo students during the year so while he had some slight catching up he practiced hard in between the AKATO classes and kept up in the class. Tomas, Jackie, and Kimberly all worked very hard getting ready for the black belt exam often times spending several hours a week on the material. 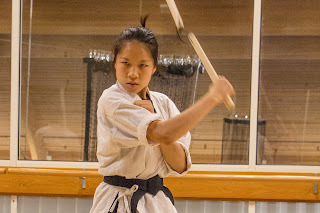 For this exam they had to know and demonstrate several drills, one steps, and several kata. 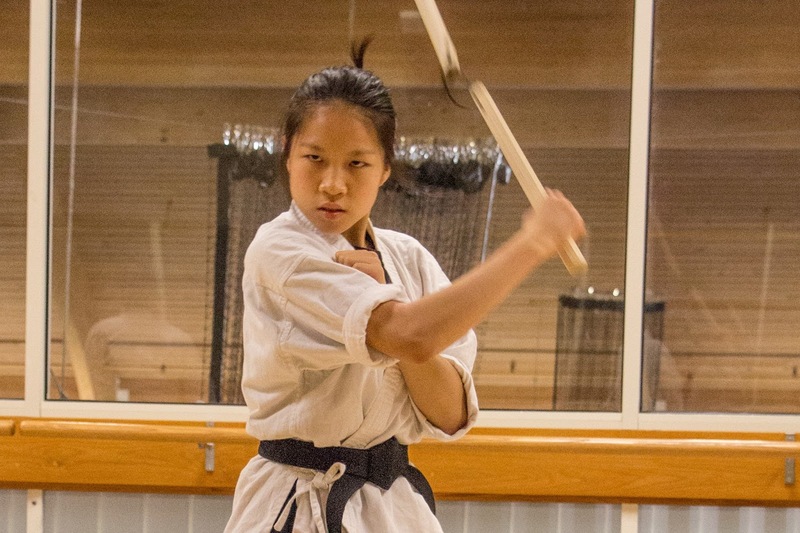 The kata or forms were more numerous than in the past classes; for the Bo (staff) there were 3 kata, for sai there were 2 kata, for tonfa (rice grinder) there were 2 kata, and for the nunchaku (flail) there were 2 kata. Over all Tomas, Jackie, and Kimberly all had a good exam since they were well prepared. Jackie for the most part took on the leadership role encouraging and really working with both Kimberly and Tomas. Tomas would spend the hour before our arnis class working on his material or stay after and work. In the end Kimberly who was the youngest and smallest student starting the class was mentioned by GM Proctor as having the best test over all. I’m proud to have these students/assistant instructors here at Hidden Sword, while we aren’t the home of former “World Champions” like some schools in our area advertise, our assistant instructors have been a good example for our students in other ways; like having strong work ethic, and continuing to train and explore other martial arts.